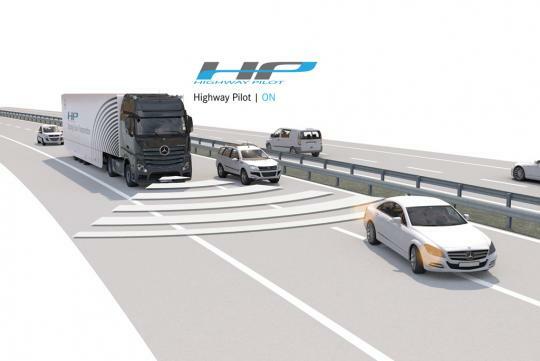 Last year Mercedes-Benz showed off a futuristic truck concept fitted with an autonomous system dubbed the Highway Pilot that enabled it to drive itself along stretches of highway, safely and efficiently. And this year the automaker showed an updated version of the concept, one that more closely resembled a production truck, and demonstrated its self-driving capabilities on some Nevada roads. 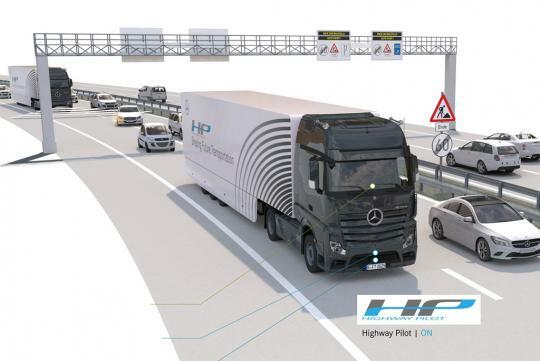 Now Mercedes is showing a production-ready truck equipped with the Highway Pilot, both to the media and German government officials. 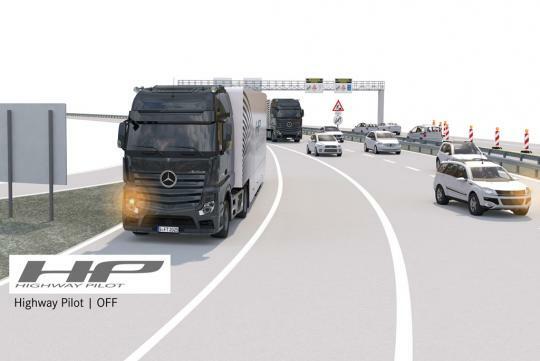 The truck is one of Mercedes’ Actros models, and it’s the first production-ready truck to drive autonomously on a highway. The special drive took place this week on a stretch of German Autobahn between Denkendorf and Stuttgart Airport. Behind the wheel was Wolfgang Bernhard, Daimler’s head of trucks and buses, and in the passenger seat was Winfried Kretschmann, the Prime Minister of the German state Baden-Württemberg. 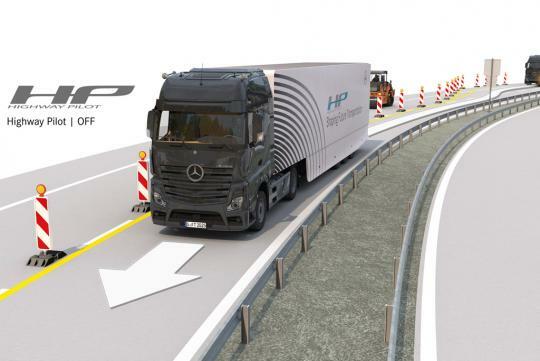 Right now the truck is only allowed to travel autonomously in a test phase but according to Mercedes the technology is ready for production. For its initial test, Bernhard drove the truck from a service station out onto the Autobahn. 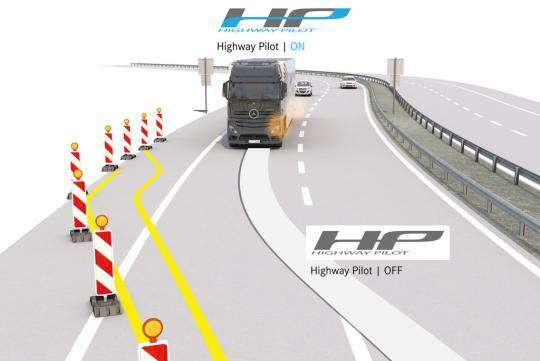 As soon as the truck entered the flowing traffic in the right-hand lane, its Highway Pilot switched on and was able to take over full vehicle operation. During the test, the truck meticulously kept to its lane and maintained the optimum distance to the vehicle in front of it. When the truck finally reached the exit for Stuttgart Airport, it asked Bernhard to take control. The test was then repeated in the opposite direction. Along the way there were road works to deal with. At this point, the truck in advance asked Bernhard to take control. 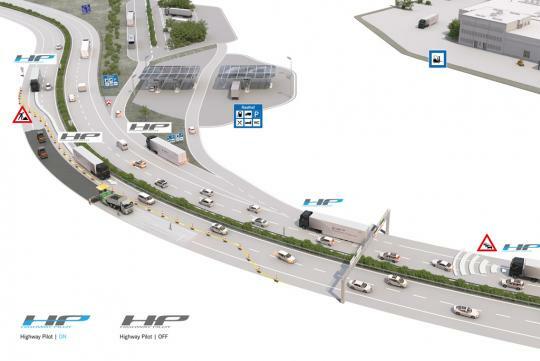 Once the truck cleared the road works, however, Bernhard was able to reengage the Highway Pilot system. Crucially, if there was no reaction from Bernhard, the truck would bring itself to a standstill independently and safely, Mercedes says. Making this all possible are complex computer processing and multi-sensor fusiontechnology. 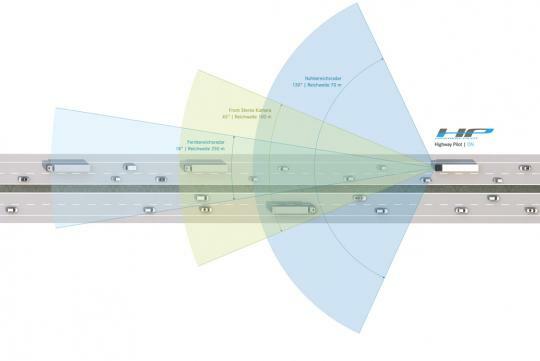 The sensors include radar and stereo camera monitoring systems capable of reading the road up to 820 feet ahead. 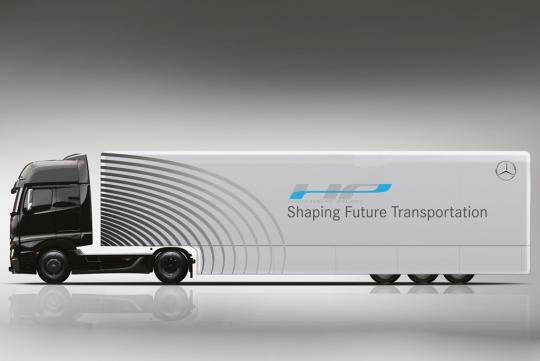 As for when we might see something like the Highway Pilot system available in showrooms is still up in the air. The current hurdle is a familiar one: legislation. Mercedes says it is maintaining dialogue with all possible stakeholders in autonomous vehicles, from government officials to business owners, and suggests that some form of fully autonomous driving may be available by 2020.